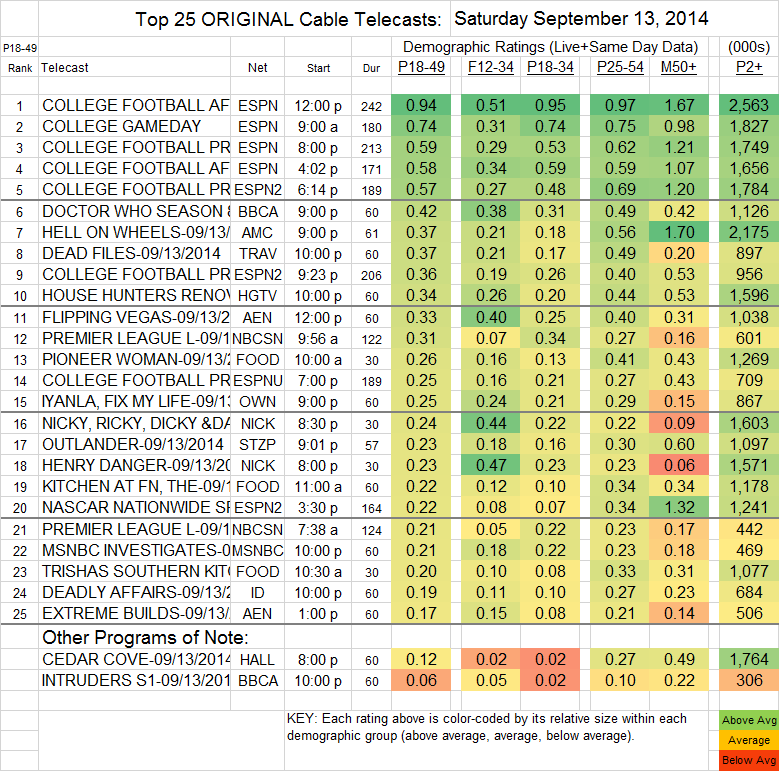 SATURDAY CABLE was dominated by college football, which will be the case for most of the fall. Note that Lifetime’s backdoor pilot DELIVERANCE CREEK had a 0.27 rating in 18-49s, with 926K total viewers. That was down from the 0.64 for last week’s Lifetime Saturday movie THE BRITTANY MURPHY STORY. BBCAmerica’s DOCTOR WHO was steady at 0.42, while INTRUDERS was at 0.06/306K. HELL ON WHEELS (AMC) fell 0.04 to 0.37. (For those who are curious, the rerun of TURN that AMC has been airing after HELL was at 0.11/724K.) On Starz, OUTLANDER grew 0.03 to 0.23, while THE CHAIR shrank to 0.02 in 18-49s, although it was up to 161K in total viewers. CEDAR COVE (Hallmark) lost half a tenth to 0.12.